'This book offers an excellent description of quantitative and qualitative design and analysis taught in the context of three inquiry pathways: knowledge development, social inquiry, and social research. Furthermore, it provides an excellent overview of both quantitative and qualitative methods with regard to their different epistemologies, methods and techniques. 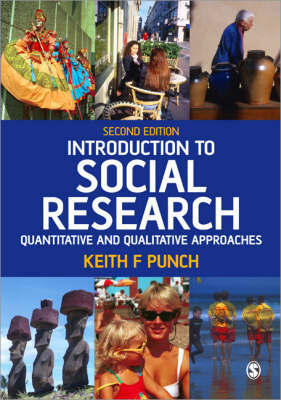 Additionally, Punch provides information guiding students in the use of computers for quantitative and qualitative analysis; and a wide range of illustrative examples to give the book a practical flavour...I would not hesitate to recommend it to my undergraduate students' - "Forum: Qualitative Social Research". 'A carefully crafted introduction to social research methodology. The author guides the reader through the research process in a comprehensive and logical way which is particularly helpful for the new researcher. A great resource for anyone involved in social research - novice or experienced' - Dr Mary Kellett, Open University.Building on the success of "An Introduction to Social Research", this Second Edition has been fully revised and updated to provide a broader coverage of a range of methodological approaches for third year and postgraduate students across the social sciences. This book includes features such as: wider coverage of qualitative research methods, including sections on action research and discourse analysis; more pedagogical features such as student exercises and illustrative examples to ensure this is a practical, student-friendly guide; and, more in-depth examination of the ethical issues involved in social research. A comprehensive and accessible introduction to qualitative, quantitative and mixed empirical methods, "An Introduction to Social Research" is an ideal starting point for all students and researchers in the social sciences.